It was 7am when we left the house and to our surprise, Nathan didn’t cause too much trouble in our 2 hour journey to Stonehenge. He ate an apple and had some tea and that seemed to be enough to keep him quiet. Although we woke up at 6am, he did not fall asleep in the car anymore. I wanted to visit Stonehenge for a long time now and finally, I can take it off my bucket list now! I like visiting places like these, even if people like my little sister for instance, find it boring. Me and my husband love traveling and visiting all sorts of places. It’s better that staying at home watching TV or whatever people and teenagers do nowadays. To find more amazing days out in your area, visit Days Out Now. Our first stop was obviously Stonehenge. We took Sasha with us but we had to leave her in the car unfortunately. Dogs were not allowed at the stones and you couldn’t take the shuttle bus with her either. We considered walking to the stones but it is quite a long journey and neither me or Nathan can walk that much at the moment. The weather was also very nice, but very windy indeed! 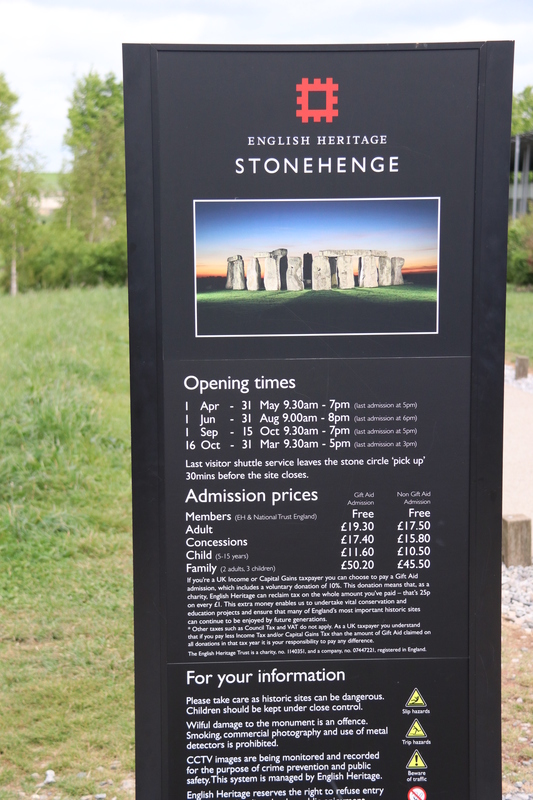 The entry was £17.50 per adult and we were offered the English Heritage membership but didn’t want to purchase it at that point although it would save a lot of money if you visit these places a lot. The membership is £54 per adult and can be purchased here. We then went to Harnham Water Meadows so that Sasha could play a little as well. It was a 20 minute drive from Stonehenge and it is a nice little area where you can take your dog and have a picnic. We didn’t find a place to park on that road so we parked the car on Constable Way, one street away. Although an old lady was “nice” enough so say “I’m fed up with people parking here. You never know when an ambulance needs to be called!”, so we parked further down the road to make her happy! Our next stop was the Old Sarum. I loved the view from up there and fortunately, Sasha was allowed inside too. Even if you don’t go inside, the field is huge and I guess it’s a wonderful place to take your dog or even go for a walk there if you live locally. The price was £4.80 per adult but I wouldn’t necessarily say that it’s worth going inside. There is not much to see to be honest and you could get the same view from outside the castle. If you have the English Heritage membership however, you go in for free. Lastly, we visited the Boscombe Down Aviation Collection since it was only a 4 minute drive from the Old Sarum. The entry was £8.50 per adult but we really enjoyed it there and I believe Nathan did too. It was awesome to see so many planes and be able to go inside them as well. You are allowed to take as many photos as you want which was also great. Round the corner from the Boscombe Down Aviation Collection, you can go skydiving and I so want to do it, but since there’s 2 more weeks and I should give birth to our second baby, skydiving will have to wait! I know there are so many other nice places to see in Salisbury and I do recommend visiting everything that you can if you have the time and energy. We were very tired after this and considering that the journey home takes 2 hours, we decided to head home! A trip to Keukenhof – The flower garden!